Not too long ago, I noticed that my ring wouldn’t come off. I used to take it off occasionally to check that I could get it off, but over the last couple of months I’d forgotten, and my finger had swollen, until i tried, and discovered that it wasn’t going to budge. I tried soap, moisturiser, ice and even Windex. Finally, we had to get it cut off. The ring, not my Finger. I love the ring, it’s always been my favourite. But considering my finger’s future, it had to be done. This is my finger before, and after. 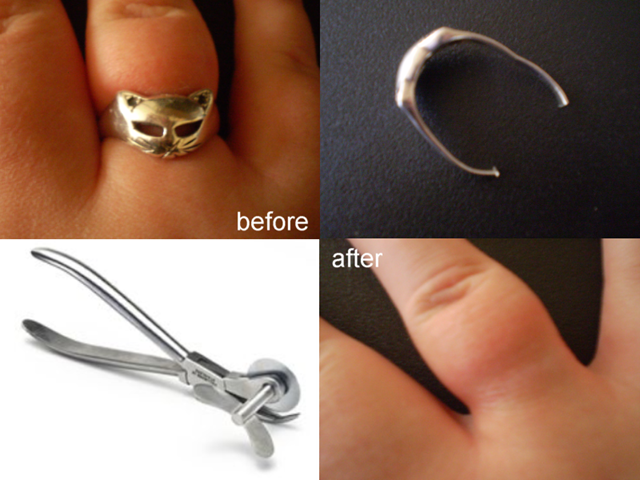 There’s a pic of my ring, and the tool they used to get it off, which was cool. As for General annoyance of the day. People who don’t sit on empty seats at the bus stop, but clamber as though they’re desperate for a seat to get on the bus. Now, I need the seat and anyone who has a problem with that can call my Physio or any one of my Doctors, but I’m also not a pushy person, so I do sit at the bus stop, meaning people standing think that because they’re in line, they have right of way over disabled people. I’m never bold enough to say anything, but occasionally when I get strange looks for sitting in a disabled area, and not getting up for middle aged people, I tend to take longer putting my ticket away a bit slower, showing off my concession card. Don’t get me wrong, I don’t sit in the disabled section on busses with a bunch of seniors on their way to weekly Bingo, but I prioritise myself on the situation, such as age, tiredness, how long they’ve been at the bus stop, stress and my own pain. Not to mention if they annoy me at the bus stop, I make it a point to step in front of them. I was thinking that everyone should be assigned a number, 1 being the highest priority, all the way down to 10, and if your number is say a 5 over a 6, you get the seat. I’d say I’m a 4 or 5. I need to sit. My back kills if I have to stand on a bus, and I can see people looking at me, and my looks of pain on the edge of tears. But no one stands. They don’t see my Disability. They don’t Understand.